With it's head office based in Warrenpoint, Co. Down, PC Plant & Construction are the civil engineering brand of the business. PC Plant & Construction have the capacity to undertake varied contracts of a diverse and complex nature. We currently hold the Small Scale & Responsive Works Contract for the Armagh/ Newry & Mourne areas up to 2013, with a possible extension of same up to 2015. This work involves the compltion of small scale remedial work to footpaths, carriageways, kerbing and drainage on behalf of DRD Road Service. We have held this contract with the Department for a number of terms and are held in very high esteem by Department officials due to the very high standards of our workmanship. PC Plant & Construction are registered builders with the National House Building Council (NHBC) and have held this registration with them since 1998 (Reg. No. 2677) and are rated A1 status. Indeed, we achieved a Pride in the Job Award from NHBC (one of the industry's most sought after accolades) in recognition of our commitment to produce high quality homes at Cushowen, our development in Burren. 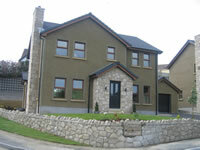 Through our dedication to excellence in the design and construction of the houses we build, the quality of the locations we choose and the customer service we provide, PC Plant & Construction in conjunction with Warren Proeprties have gained the respect of many homebuyers across the district and further afield with a whole range of quality housing schemes. These can be viewed in detail by visiting the developments section of this website. The skilled operatives employed by the company are time served craftsmen, many of which have been with the firm throughout their working lives. The low labour turnover percentages are a reflection of the excellent working arrangements and conditions that P.C.Plant & Construction commit to with all of our employees. There is a strong commitment and ethos to providing quality workmanship and this is further evidenced by the provision of a specific training room for any off the job training and refresher courses that are required. All operatives are required to have the appropriate training for their specific work area and the necessary CSR card. Sub-contractors are vetted and approved through the company’s quality assurance procedures. PC Plant & Construction pride ourselves in the very high standard of after sales service that provide, whether it is as a result of a house purchase or a civil engineering contract. At the handover of a new home or the completion of a civil engineering scheme, our after sales team will be there to ensure that minor problems if any are dealt with swiftly and professionally and to provide peace of mind throughout this process. On occasion and as part of a number of our housing schemes (predominantly apartment schemes and gated communities, we have put in place a management company (where it is deemed to be suitable) which is responsible for the maintenance of any shared spaces, including parking, landscaped areas. The success of such a company (which is operated by PC Plant) is very evident from the high standard of cleanliness and open spaces at our development named Malinmore Mews – Dublin Road, Newry and Carraig Mhuire – Church Street Newry. There is no doubt that the company’s main client, DRD Roads Service and any purchasers of their residential products will stand to benefit in the future from this approach to the management of P.C.Plant's civil engineering and residential projects.